Senators Feinstein, Snowe, and Schumer have proposed a Cash for Clunkers bill in response to the House compromise of May 5. Full details of the Senate bill are at the end of this post. This is a much stronger plan than the House compromise in terms of CO2 reductions. It is stronger for two reasons. Second, the system is more tiered than the House bill, encouraging drivers to seek higher levels of gas savings, but giving them the option to choose any level they wish above a responsible minimum. In previous posts, I've argued for a minimum of saving 1 gallon per 100 miles to pay back the 7 tons of CO2 emitted in producing the new car (this trade in would "pay for itself" in 70,000 miles of driving). Dean Chameides of Duke's Nicholas School has argued for a minimum savings of 2.5 gallons per 100 miles (which would "pay for itself" in 30,000 miles of driving). In my most recent post, I've combined these ideas to argue for a system based on a minimum gain of 2 GPHM with tiered vouchers that increase with additional decreases in GPHM. The only increase that seems too small is the 17 to 20 mpg gain on light trucks, yielding less than 1 gallon saved per 100 miles. 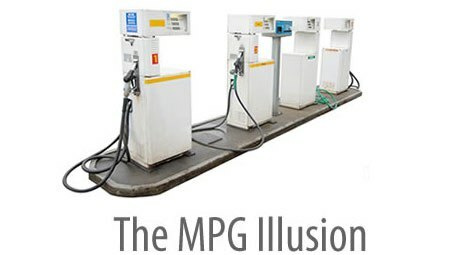 This is where the MPG Illusion and the use of GPM is critical. Many people might think that the MPG increases on the Large Light Duty Trucks are unimpressive--starting at 14 and then moving to 17, 19, and 21. But those gas savings are greater than the savings produced by larger MPG increases on the Light Trucks (from 17 to 20, 23, and 26). The night and day difference between this Senate bill and the House bill is the requirements for Large Light Duty Trucks. This bill is fairly responsible in that category. The revised “Cash for Clunkers” proposal introduced today would ensure that vehicles purchased under the program do not bring down the fleetwide averages that the Ten in Ten Fuel Economy Act intended to raise. Trade-in vehicles must be 17 mpg or below. All fuel economy values are EPA combined city/highway fuel economy, as posted on the window sticker of new cars. Consumers may trade in their gas-guzzling vehicles to be scrapped – with a fuel economy of less than 17 miles per gallon – and receive vouchers worth up to $4,500 to help pay for the purchase of more fuel efficient cars and trucks. The program will be authorized for up to one year and provide for approximately one million new car or truck purchases. There are approximately 27 million vehicles on the road today that could qualify for trade-in under this program. This proposal is consistent with the framework of the House compromise legislation, and divides the cars and trucks that would be purchased with the incentive voucher into four categories. Miles per gallon figures below refer to EPA “window sticker” values. · Passenger Cars: The trade-in vehicle must get 17 miles per gallon (mpg) or less. New passenger cars with mileage of at least 24 mpg – the current average for this vehicle class – are eligible for vouchers. o If the mileage of the new car is at least 7 mpg higher than the old vehicle, the voucher will be worth $2,500 for a new car purchase. o If the mileage of the new car is at least 10 mpg higher than the old vehicle, the voucher will be worth $3,500. o If the mileage of the new car is at least 13 mpg higher than the old vehicle, the voucher will be worth $4,500. o The purchase of a used passenger car with a mileage of at least 24 mpg would qualify for a voucher of $1,000. · Light-Duty Trucks: The trade-in vehicle must get 17 miles per gallon (mpg) or less. New light trucks, minivans or SUVs with mileage of at least 20 mpg – the current average for this vehicle class – are eligible for vouchers. o If the mileage of the newly purchased truck or SUV is at least 3 mpg higher than the old truck, the voucher will be worth $2,500 for a new vehicle purchase. o If the mileage of the newly purchased truck or SUV is at least 6 mpg higher than the old truck, the voucher will be worth $3,500. o If the mileage of the newly purchased truck or SUV is at least 9 mpg higher than the old truck, the voucher will be worth $4,500. o The purchase of a used light-duty truck or SUV with a mileage of at least 20 mpg would qualify for a voucher of $1,000. · Large Light-Duty Trucks: Newly purchased large trucks (pick-up trucks and vans weighing between 6,000 and 8,500 pounds) with mileage of at least 17 mpg – the current size-adjusted Corporate Average Fuel Economy Standard for the largest pickup trucks – are eligible for vouchers. o If the mileage of the newly purchased truck is at least 3 mpg higher than the old truck, the voucher will be worth $2,500. o If the mileage of the newly purchased truck is at least 5 mpg higher than the old truck, the voucher will be worth $3,500. o If the mileage of the newly purchased truck is at least 7 mpg higher than the old truck, the voucher will be worth $4,500. o The purchase of a used large light-duty truck with a mileage of at least 17 mpg and 3 miles per gallon higher than the trade-in vehicle would qualify for a voucher of $1,000. · Work Trucks: Under the proposal, consumers can trade in a pre-1999 work truck (defined as a pick-up truck or cargo van weighing from 8,500-10,000 pounds) and receive a voucher worth $2,500 for a new work truck in the same or smaller weight class. There will be a limit on these vouchers, based on this vehicle class’s market share. There are no EPA mileage measures for these trucks; however, because newer models are cleaner than older models, the age requirement ensures that the trade will improve air quality. Consumers can also “trade down,” receiving a $2,500 voucher for trading in an older work truck and purchasing a smaller light-duty truck weighing from 6,000 – 8,500 pounds.